The site of the Scottish camp before the battle. Flodden Hill, the wooded ridge approximately one mile south of Flodden Battlefield, was the site of the Scottish camp before the battle, where King James IV and his considerable army waited for the English forces under the Earl of Surrey to engage them in battle. They presumed that the attack would come from the South but this was not to be the case. A circular trail up onto the ridge begins at Blinkbonny Farm and takes you through a great wood - watch out for woodpeckers, foxes and other wildlife. It is obvious how King James IV presumed that the English attack would come across the flat ground of Milfield plain. The bulk of the Cheviots to the south-west effectively prevents any threat. To his left (to the east) he has a good view of the landscape. 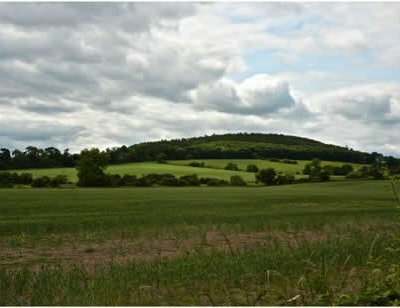 Surrey however, an experienced commander, was able to march his troops and baggage train unnoticed behind the ridge on the eastern horizon and mount a surprise attack from the rear, forcing King James to rush northwards to the small ridge above Branxton. To the north, the impressive views over the Tweed Valley and on to the Lammermuir Hills reassured the Scots that they were still in sight of their homeland. King James had done no more than ‘take a yard of English soil’ as historical documents record. He was torn between honouring the ‘Auld Alliance’ with France on the one hand and the Treaty of Perpetual Peace with England, signed with Henry VII, and of which James’s happy marriage to Margaret Tudor was an integral part. Open public access on the bridleways and public footpaths. A short section of the circular trail is across private land by permission of Ford & Etal Estates. There are no facilities here, nearest being in Crookham (Blue Bell Inn, on the A697), Milfield (Red Lion Inn / Café Maelmin) and Cornhill-on-Tweed (Village Shop / Collingwood Arms Hotel). Sensible parking please at Blinkbonny Farm (NT402364 – especially by the ruined cottages on the south side of the road). Please leave room for large agricultural vehicles and implements to gain access to gateways and farm tracks. 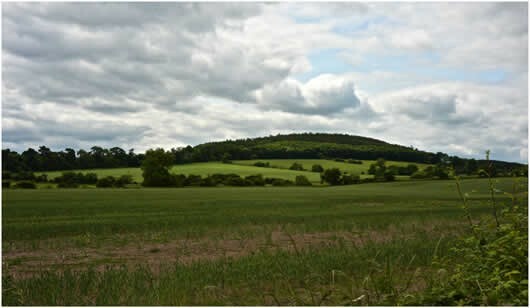 Flodden Ridge lies one mile south of Flodden Battlefield on the minor road between the A697 and Thornington.